Your 300C is a year old now and you are thinking of trading it in on a new 300D. Off you go to the Chrysler Dealer. When you see the 300D in the showroom, your first impression is that it looks just like your 300C. But wait a minute, as you look closer and talk with the new car salesman you find out that there are indeed a lot of differences between the two cars. The D is lower, taller, wider, longer and faster(1). It is more expensive;(2) has a wider selection of exterior colors; more options are available; has more of the famous red, white and blue medallions on it and the interior uses less vinyl and more leather and chrome. Talking with the salesman, you discover the exterior Cloud White is Ermine White for 1958, and Jet Black is Raven Black. But now again, as in ’56, there’s a bright gutsy red, Matador Red for 1958. The pinkish Gaugin Red of ’57 is closely matched by Tahitian Coral. Gone is metallic Parade Green, a color that defies description. In its place is bright swimming pool Aztec Turquoise. In place of metallic Copper Brown is the lighter non-metallic Mesa Tan. So as you can see, you have one more standard color from which to choose. While you are kicking the same 9.00 x 14 Goodyear 2 ½” WW Blue Streak tires, you suddenly notice the windshield is different. Gone is the non-aerodynamic spoiler. 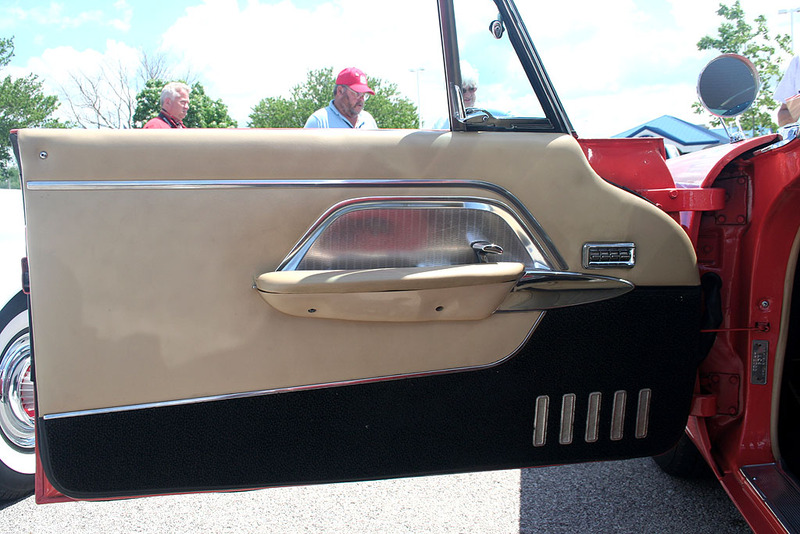 The “bubble” compound windshield (shaded and tinted) previously used only on the C convertible is now on the hardtop and convertible D.
Because of this, vent windows are also different. Walking to the rear of the car you notice the taillights are slightly different. This year has less red plastic and more chrome-like housing. The side medallions now say 300D in the familiar red, white, and blue circle. And speaking of medallions, there are four new ones this year in the wheel covers, giving the covers less the “plain jane” look. Combined with the red painted outer rim inserts, they sure do look a lot snappier, partly because the center spinners are now solid one piece chrome over just three inserted chrome “wings”. 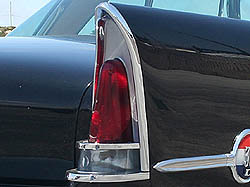 In all, Chrysler decorated the D with 10 red, white, and blue medallions: 1 grille, 1 trunk, 2 side, 1 glove box, 1 steering wheel, 4 wheel covers. 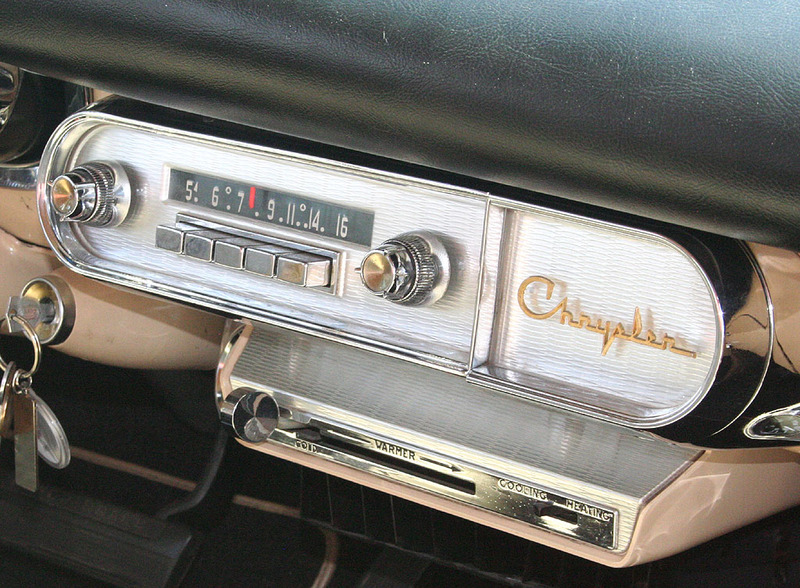 Chrysler managed to put its name in only 2 places, outside on the hood and inside on the ash receiver. “300” shows up in 13 places. These are: all 10 medallions, 2 door sill scuff plates and in large chrome numerals in the dip of the back seat. Looking at all those ornaments, you sure know it’s a 300. It looks like Chrysler designers couldn’t see the forest for the trees. They got so hung up on the 300 logo they forgot it was a Chrysler. So someone quickly hung these tiny hood letters on it so it would say Chrysler somewhere on the outside of the car. 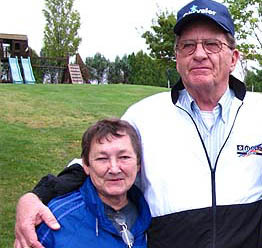 Maybe that’s why they look like they were an afterthought – they were. Opening the door of the D, you are looking at an altogether different interior from last year. The D seats are 2 different leather grains. The pigskin looking cowhide insert pleats run vertically forming a pseudo-bucket seat. 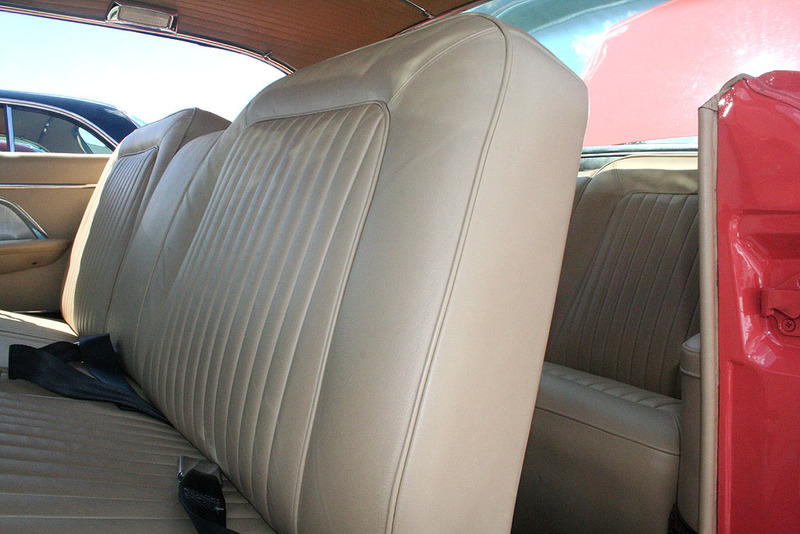 All the other seat leather is a smooth grain to enhance the pleating. 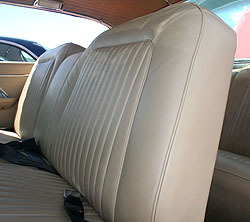 The unusual leather grain of the seat inserts is repeated in the doors. (My C door panels are vinyl). Embossed 300 numerals are not repeated on the top of the door panels this year. Instead of plastic, the seat skirt housing the power seat switch is an encompassing chrome wrap around piece. The D offers a choice of 2 headliners, a plain vinyl with retaining strips running the width of the car, or a padded headboard with cloth lining indented in striped and squared pattern with retaining strips running the length of the car. 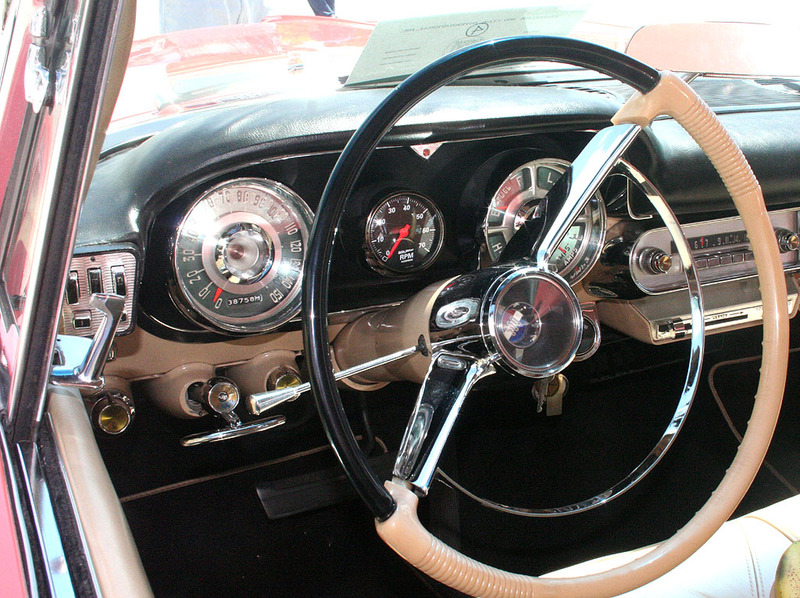 Sliding behind the wheel, which is easier to do than in a C(1), you see the familiar 300 medallion in the steering wheel. But the colors of the steering wheel are reversed this year with the tan on top and the black on the bottom. You look for the trusty 150 MPH speedometer and there it is along with all the rest of the gauges. But here again, something is different. It’s the housing for the gauges. 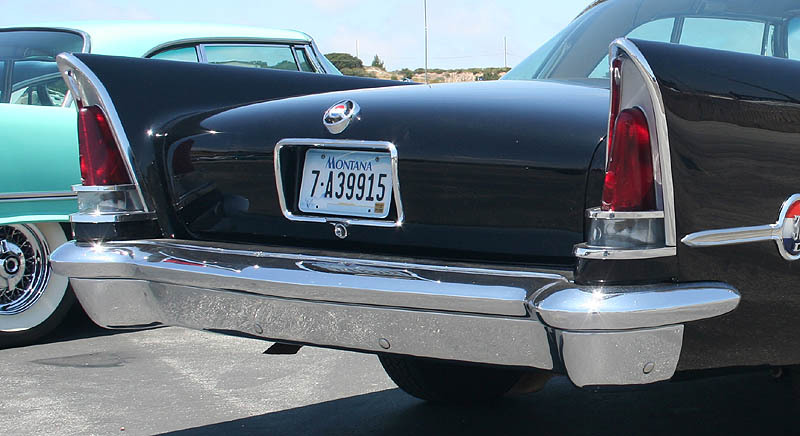 Once painted tan, it’s been replaced by a dazzling chrome housing for each gauge with blue tinted faces. 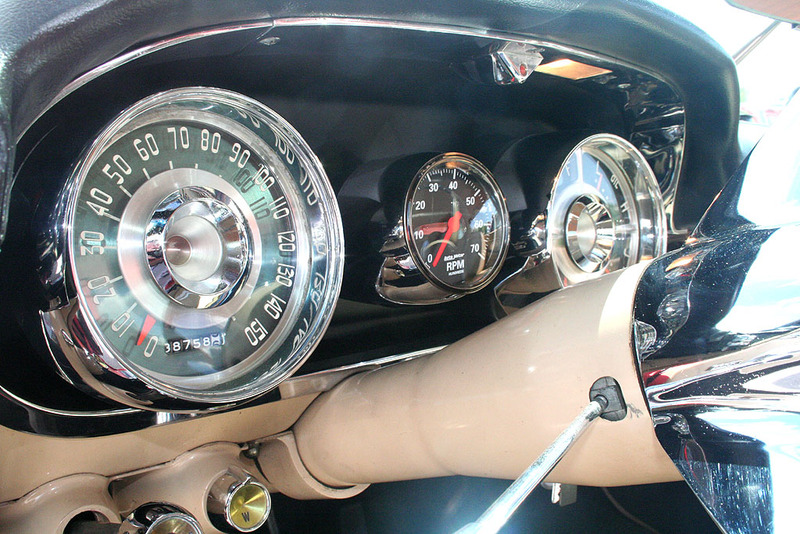 Unfortunately, there is still no tachometer – the same old clock sits there. 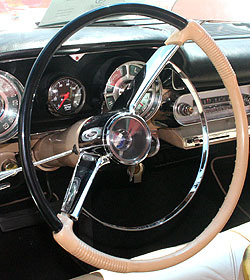 The dash for the gauges is flat silver paint in the early models and black in the later models. All the metal stamping has a new pattern this year from the dots in the C, to squiggles in the D.
Being thorough, Chrysler has changed them all, the door panel insert by the handle so you don’t scratch the leather, the transmission gear selector housing, the radio, heater and as receiver housing, all squiggles now. You have more visibility this year than last. (1) Also, the rear view mirror has been moved to the dash pad so it’s not hanging from the windshield moulding. You have more headroom in the front seat. Both seats sit higher, giving you more leg room front and rear(1). One thing that hasn’t changed is the rich smell of leather that stays with the car for years. You can’t stand it anymore. You have to know if the monster 392 hemi has changed, or even if indeed it is still under the hood. Yes! It’s there and more. Five additional horsepower has been added. Hot Damn! Whooey! It’s 380 horses worth. Compression is increased to 10.0 to 1. Maximum torque is also up to 435 ft. lb. at 3600 RPM’s. You now more than ever need premium gas to run it. The service manual recommends 99.4 Motor, 105 Research, but that’s no problem. You’ve also got a new cam to improve low end(4), so she ought to be better out of the hole than the C.
recalibrated to give you more gas for your extra horses. Closing the hood, you’re ready and raring for the big TD (test drive!). Racing has been played down even more this year. So naturally, you’re very curious about performance. You turn the key, push the “N” button, bring the engine to life, and stomp it a little to give the salesman another grey hair. You’re wheeling with constant-control steering, a new refinement this year. Manual steering is now an option that goes with a racing package: manual steering, manual transmission, manual brakes, and air conditioning not available. (3) Speaking of racing, Chrysler, in an effort to play down the racing characteristics of the D, lists only 5 rear axle ratios available this year: the standard 3.31 to 1, 2.93, 3.15, 3.54, and 3.73. But they also offer a 3.90, 3.91, 4.10, 4.30 and 4.56 to 1. (1) Just ask them. They’ll tell you. And knowing Chrysler, who knows what else they have and aren't telling? You gotta ask the right question of the right people. As you’re cruising, think of all the “goodies” you can order this year that you couldn’t get last year – Auto-Pilot, remote control outside mirror, 40 amp generator and a front license plate frame, not to mention (FUEL INJECTION!) All the other “goodies” are still there: Air conditioning, Electro Touch Tuner or Music Master Radio, Rear Shelf Radio Speaker (hardtop), Power Antenna, Rear Window Defroster (hardtop), Custom Conditionaire or Instant-Heat Heater, Power Windows, 6-way Power Seat, Solex Glass, Shaded Backlight (a tinted, shaded rear window for hardtops), Stone Shields – rear quarter panel, Sure-Grip Differential, and Low Back Pressure Exhaust System (2-1/2” diameter for Fuel Injection). After shaking some kinks out, checking second gear pull on the old pushbutton, listening to the throb of the carbs opening, hearing the Blue Streaks squeal and feeling the tight and sure handling of the D, all in the course of an average run, you look over and see the cringing, shuddering blob that was the salesman and decide to give him a break and head back to the barn. You get back, look at your old C and think a minute. You know it’s true. It does take a year to work all the kinks out of a new model body style. The D had definitely been refined and perfected. (1) Automobile Manufacturers Association Consolidated Specification on Questionnaire. Optional rear axle ratios as listed in article, pg 11. (2) “THE POSTWAR YEARS CHRYSLER & IMPERIAL,” Richard Langworth. (3)	Presenting the Chrysler 300D for 1958. Chrysler Division, Detroit, MI. (4)	“THE MILESTONE CAR,” No. 15, Spring 1978, “Building the Brute,” Gil Cunningham, Pg. 8.